Cassette tape album sales grew 74% in 2016 | What Hi-Fi? It's not just vinyl that's seen a revival in recent years – sales of cassette tapes were on the rise in 2016. Unless you've been living under a rock these last few years you'll be all too aware of the vinyl revival that has taken place. Whether a desire for a physical product in the age of streaming, a love of the vinyl sound or simply a form of nostalgia, vinyl sales have become a slightly chunkier slice of the music pie in recent years. Now it seems cassette tapes are the latest retro audio format to enjoy a resurgence. Nielson Music reports that cassette album sales in the US increased by 74 per cent year-on-year in 2016. But before you rush to check the share price of BASF or start dusting-off your Nakamichi Dragon, we should point out that 2016 sales totalled a meagre 129,000, up from 74,000 in 2015. This, as Billboard reports, is a tiny share of the more than 200 million albums sold in total in the US last year, 13.1 million of which were on vinyl. Nevertheless, cassettes have seen a mini resurgence. And once again, high-street store Urban Outfitters has played its part. Not content with shifting serious numbers of vinyl records and (not very good) Crosley turntables, the store has also released exclusive cassette tapes from artists including Justin Bieber and The Weeknd, helping to boost sales. 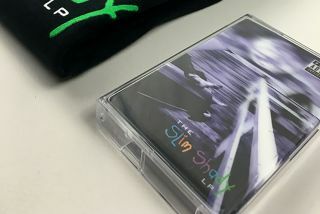 As with vinyl, some classic albums have also been re-released on cassette tape for this new audience, such as Eminem's The Slim Shady LP. Most releases come with digital download codes, allowing people without cassette decks to collect the tapes without worrying about the pesky business of trying to play them. With a report last year suggesting nearly half of people buying vinyl don't actually play the records, it's easy to assume something similar may well be true with cassette tapes - though we have seen the release of some new budget portable tape (and CD) players. Last year it was reported that a cassette tape revival was on the radar of the Recording Industry Association of America (RIAA) - a claim quickly denied as the numbers were reportedly still too low. It seems Nielson Music is happy to crunch the numbers... but they are indeed pretty low.